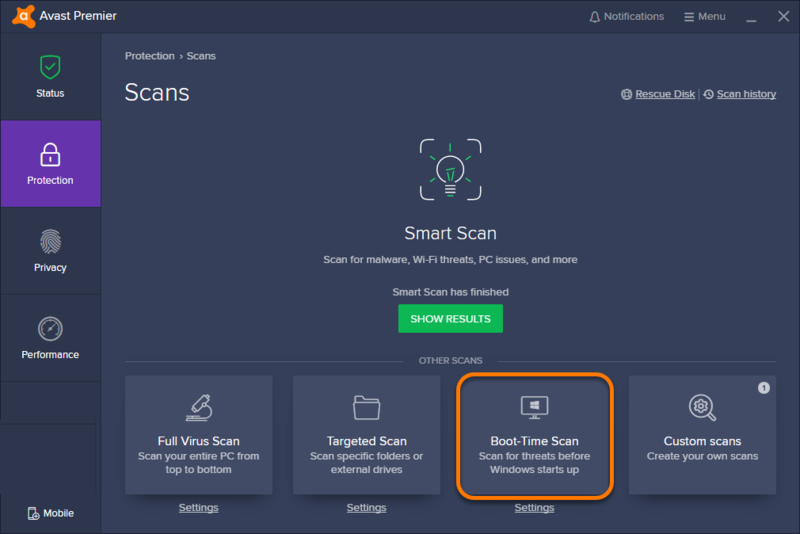 If you suspect that your PC contains malware, Avast Antivirus allows you to schedule a Boot-time Scan to run the next time your computer starts. It scans for known types of malware and removes threats before the operating system and other services are running. Scanning during startup improves the chances of detecting and removing malware before it can counteract. Boot-time Scan is an advanced feature designed to use when you suspect a threat in the system, and usually takes some time to run. It is manually scheduled to run as needed, not on a regular basis. 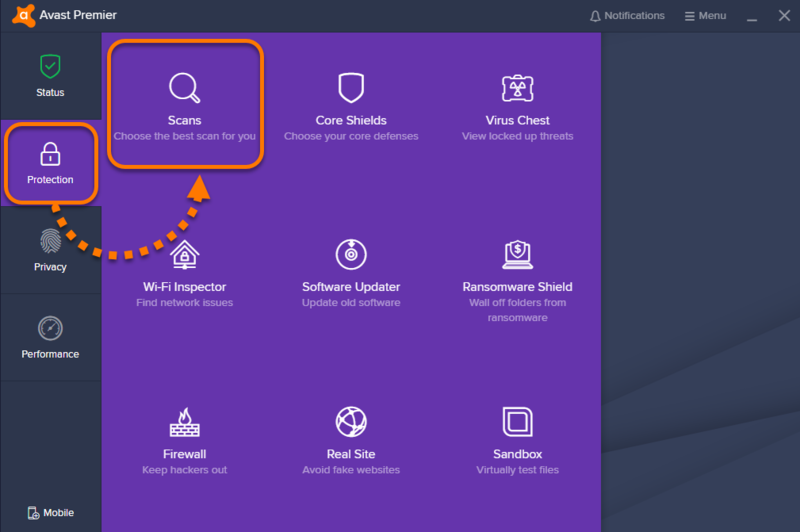 Open the Avast user interface and select Protection ▸ Scans. Click the Boot-time scan tile. Click Install specialized definitions, then click Run on next PC reboot to run the scan during the next system restart. 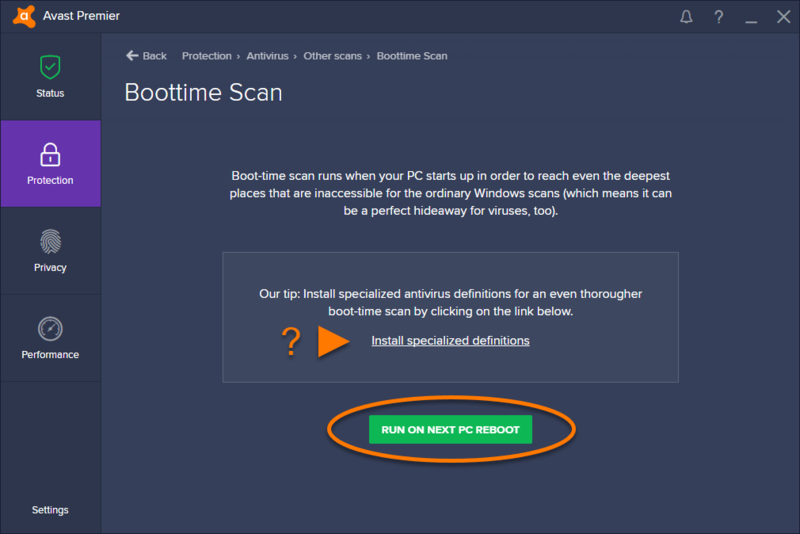 When you click Install specialized definitions on the Boot-time Scan screen, Avast downloads all virus definitions from a cloud database. If you skip installing specialized definitions, Boot-time Scan scans your PC based only on the latest virus definitions that are already downloaded. After clicking Install specialized definitions, you are not offered this option again. Restart your PC. When the system restarts, a Boot-time Scan progress screen appears as Windows loads. For any detected threat select which action to take unless you have previously specified automatic actions in Boot-time Scan settings. The scan usually takes several minutes, but the duration varies depending on the speed of your system and the number of files to be scanned. When the scan is completed or skipped, Windows continues booting up. Click Settings located under the Boot-time Scan tile. Areas to scan: use the drop-down menu to specify which data space you want the scan to analyze. To add another area to the list, click Add. To remove an area, click the relevant row, then click Delete. Heuristics sensitivity: use the orange bars to indicate your preferred level of heuristic sensitivity. Heuristics enable Avast to detect unknown malware by analyzing code for commands which may indicate malicious intent. 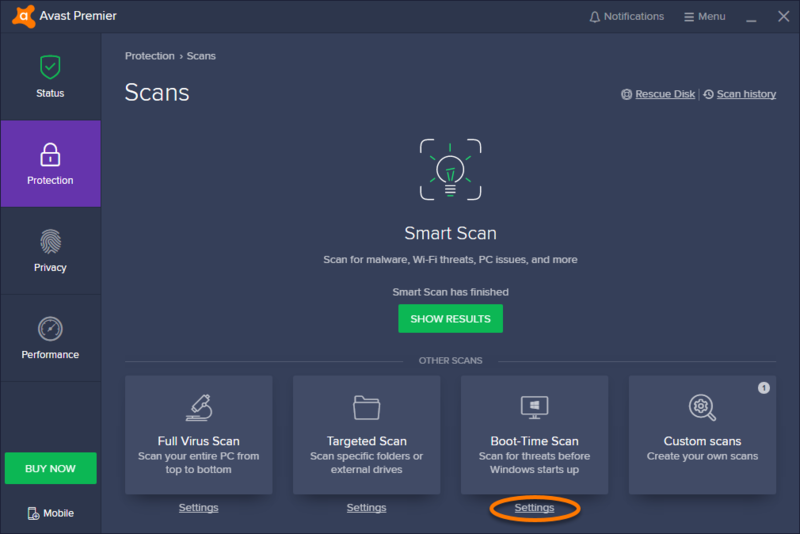 Scan for potentially unwanted programs (PUPs): ensure this box is ticked if you want Boot-time Scan to look for programs that are stealthily downloaded with other programs and typically perform unwanted activity. 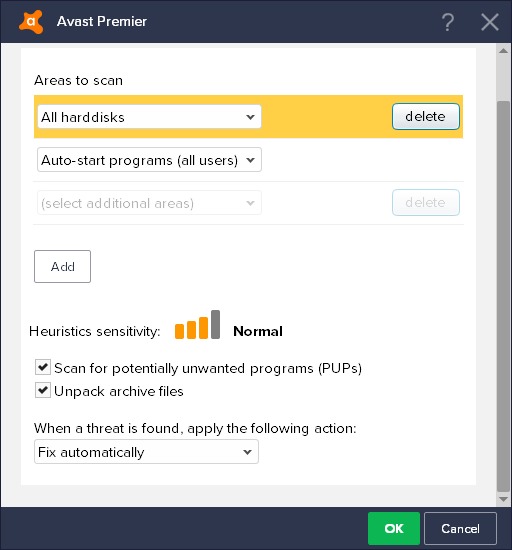 Unpack archive files: ensure this box is ticked if you want Avast to unpack compressed files during the scan. Fix automatically: attempts to repair the file. If unsuccessful, moves the file to the Virus Chest or deletes the file if neither action is successful. Move to Chest: sends the file to the Virus Chest where the file cannot harm your system. Repair: removes malicious code if the file is only partially infected. This action is not possible if the entire code is malware. Ask: notifies you of suspicious files and allows you to select an action for a specific file. Delete: permanently removes the file from your PC. No Action: makes no changes to the content or location of the file (not recommended as an automatic action). Use caution when configuring Boot-time Scan to take automatic actions. In the event that a critical system file is incorrectly identified as malware due to a false positive issue, the Boot-time scan may delete the file if an automatic action is set up. Though Avast has a number of measures designed to prevent such issues, false positives may occur.